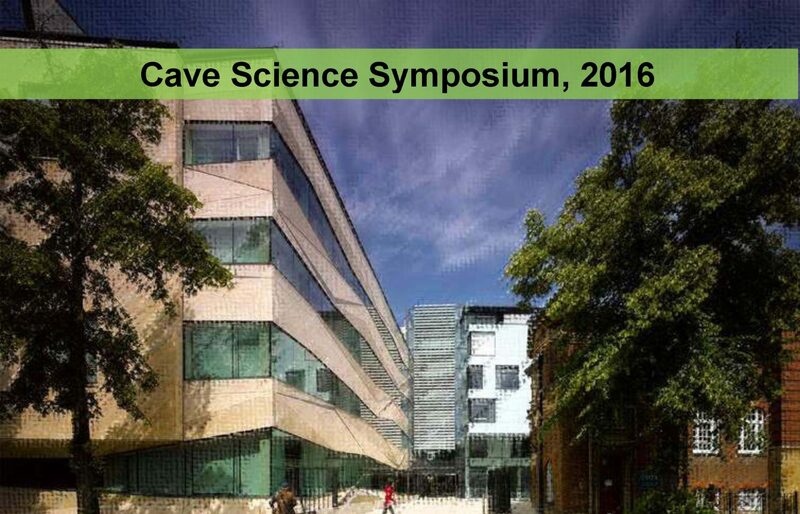 The British Cave Research Association is pleased to give the final details of its one-day annual Cave Science Symposium to be held on Saturday 22nd October, 2016 in Oxford, UK. Whether you are an academic, an amateur scientist, or a caver wanting to find out more about the karst environment, you should find something of interest at the Symposium. A provisional programme of presentations is attached and the BCRA AGM will be held from 12.00 until 1.00pm. For any further information, please contact the lecture secretary, Dr. Gina Moseley by 19th October at: gina.moseley@uibk.ac.at. Registration will take place on the day between 9.00 and 9.30 am in the Earth Science Department building main atrium. The main rotating glass door to the building faces South Parks Road and is clearly marked with signs. The admission charge, to include morning and afternoon refreshments, will be £5, with free entry to speakers, students and BCRA members. Donations to help finance the meeting will also be accepted. There will be the possibility to join a short tour of the geochemistry laboratories after the close of the main symposium on 22nd October, 2016. Please email Gina Moseley by 8th October, 2016, if you would like to join the tour. The event is being hosted by Prof. Gideon Henderson and Dr. Stacy Carolin. Oxford is easily accessible by road and rail and is just over an hour’s travel from London’s Heathrow Airport. Parking is hard to find in Oxford so it would be wise to use the Park and Ride services (https://www.oxfordshire.gov.uk/cms/public-site/park-and-ride). Visitor parking at the department is for people with disabilities only and is by prior arrangement. Following the symposium, we will head for an informal evening pub meal at The Royal Oak (https://www.theroyaloakoxford.co.uk/), half a mile from the symposium venue. It’s a favourite of the Oxford-based Earth Scientists! The Symposium is tentatively scheduled to finish at 5.20pm, followed by a short lab tour at 5.30pm, and the meal at 6.30pm. If you are interested in attending the meal please email Gina Moseley (gina.moseley@uibk.ac.at) by October 8th and she will send you the menu as soon as it becomes available. Examples of the food that the Royal Oak serves and their prices are available on their website, though note that this is the summer menu and will change by the date of the meal. Field-Trip to Box Mines, Wiltshire – Sunday 23rd October, 2016. In memory of Charlie Self. The field trip to Box Mines is now full. Please direct any questions related to the field trip to Dr. Trevor Faulkner (t.faulkner@bcra.org.uk). Please contact Stacy Carolin (‎stacy.carolin@earth.ox.ac.uk) for details of the venue and local facilities in Oxford. Contact Gina Moseley (gina.moseley@uibk.ac.at) for details of the programme and for enquiries concerning oral or poster presentations. Contact Trevor Faulkner for details of the field trip (t.faulkner@bcra.org.uk).